Unity Asset Explorer refused to extract these so I used the unity.bms script to extract all the .tex files in the asset explorer it calls them "28 (Texture2D - UNUSED28)" and "28 (Texture2D - UNUSED29)" and doesn't want to convert them to .dds files. These textures are crunched DXT1 (UNUSED28) / DXT5 (UNUSED29). These formats were added with Unity 5.1. The current version of Assets Bundle Extractor supports these (in case of this game, the 5.0.1f1 type database is required). So I tried using the .bms extractor on a unity5 .unity3d file with this script: http://aluigi.altervista.org/bms/unity.bms and also with this script: http://aluigi.altervista.org/bms/unity3d_webplayer.bms . And none of the scripts worked. I also used this UAE https://7daystodie.com/forums/showthrea ... -Extractor, but that didn't work either. The game was recently updated from Unity3 engine to Unity5 engine, and now "Disunity" doesn't work anymore, because I used to use it, so it's pretty clear that something drastically changed in the game files, since it seems that nothing is extracting these new unity5 stuff from Hearthstone anymore. The file that I've uploaded, contains .ogg music files. So if you've possibly managed to extract the file, (and if it contains .ogg files) then you know you've done it right. I really hope that you can help, since I've seen that unity5 files from other games are able to be extracted, but it seems the files from Hearthstone is different somehow. It's a UnityRaw archive, this is probably the 3rd or 4th one I see on the forum so I guess it's time to find a solution for this format. Anyway I checked it and basically it's all made by FSB5 archives so my suggestion is to use fsbext with the options -o -1 on it and you will be able to extract everything. UnityRaw file are like UnityWeb except they aren't compressed. These are sometimes used for standalone games (probably because they don't always have to be repacked). I have the fsb extractor on my PC, but I don't know how to enter the "-o -1" command, since all it does when I open the "fsbext.exe", is allow me to select the file, and then the destination... it doesn't give me a place to enter any commands. Could you perhaps explain the process alittle more for a layman please? You have two ways to add that option, using fsbext from command-line or creating a shortcut to fsbext.exe appending -o -1 to the Target entry of its properties. Ok cool, thanks I did that, and it worked. But none of the .ogg files want to play now And their names aren't correct at all. I'll just wait until you can possibly create a correct .bms script for this type of Unity5 file, or maybe until the guy who does "Disunity" updates his project. Ogg are a big problem with fsbext because they are a sequence of ogg frames without the header. There are a couple of tools that you can try but still you need each separate fsb file extracted first. Why can't i reimport with the unityweb script ??? Because it's a compressed file system so the files are uncompressed but the whole archive is compressed. aluigi, you're still working on this little Unity5 problem right? Like for instance with the .unity3d file that I provided previously? Would be great if there was a .bms script that worked for it. 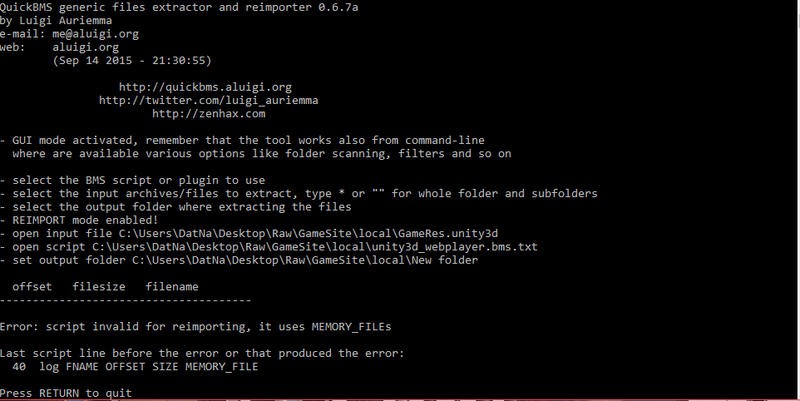 I have just updated the unity.bms script to version 0.2.4 for supporting the UnityRaw files. Basically it changes nothing to your specific case while it changes a lot for the other UnityRaw archives. Ah ok I see. So, what's the problem the file? Does it use a different compression method to other Unity5 files? Because it seems like only these files have trouble extracting... I even tried other extractors that repute to be able to extract unity5, and they all failed. Ah right, ogg files in FSB5 are not supported for the extraction in fsbext. I mean that they are extracts "as-is" and can't be played with the common players. Is posible extract meshes from The Peanuts Movie: Snoopy's Grand Adventure? Any news on the unityraw file from above? I'm also wondering... it seems there's a rather large demand for having this unity3d thing being extractable. But Aluigi already acknowledged that he realizes that fact, so I'm guessing he's already working on it. I have not worked on it yet. No problem, thanks for letting me know!